Other than by car, the most popular mode of transportation is airline travel. One incredible aspect that makes San Diego such an appealing destination is that its airport is only a mile and a half from Downtown San Diego, the PETCO Ballpark and a myriad of attractions, adventures and restaurants. At the same time, it’s a modern airport with an average of 500 flights each day via approximately 25 passenger and cargo airlines. 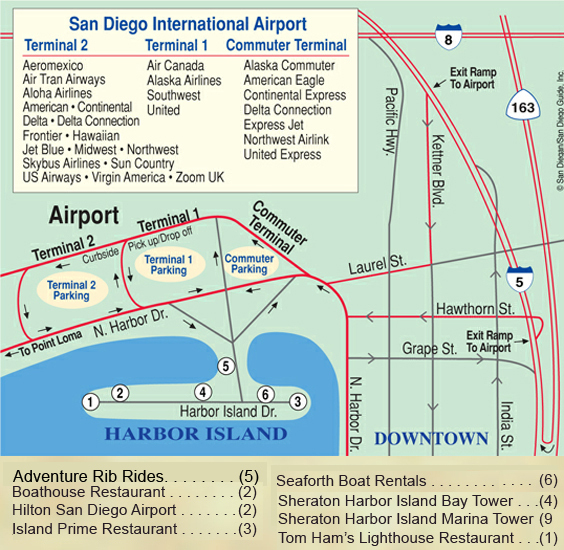 Lindbergh Field (619-400-2400) is near downtown San Diego and Harbor Island.See the map for the airlines and terminal locations. For a better lay of the land, visit the online chapters for Downtown San Diego, Harbor Island, Seaport Village, Little Italy and the Embarcadero. Parking is also available at off-site parking lots near the airport. Arriving at the airport is also very easy, it is common for friends and family to drop off their guests right at the terminal gates. This list is a handy reference for knowing which airlines are at which terminals for arrival and departures. Check the status of planes arriving here. The airport offers on-site parking at each of the three terminals—Termals 1 and 2 and the Commuter Terminal. Free intra-terminal transportation is provided via the “Red Bus.” Parking at the airport costs ($3) per hour, ($21) for the first 24-hour period, and ($26) per 24-hour period thereafter. Parking fees can be paid at the cashier booths as you exit the parking lot, or at one of the Express Parking Pay Stations located at Terminals 1 and 2. The Courtyard by Marriott Hotel at 2592 Laning Road in Liberty Station (619-221-1900), is just within view of the Airport. They are ideally located on the waterfront affording them beautiful views of the bay and downtown San Diego and are home to a wonderful place to dine, the Twentyfive92 Restaurant. Doubletree Hotel Downtown at 1646 Front St. Downtown (619-239-6800), offers breathtaking views of San Diego’s beautiful harbor. Take advantage of complimentary high-speed Internet access and television with HBO® and On-Demand. In the morning, start smart with their exclusive in-room Wolfgang Puck coffee. Sheraton Harbor Island Hotel’s Bay Tower at 1590 Harbor Island Dr. is the (619-291-2900). It too is a stellar resort with balconies offering bay or marina views. For a great weekend getaway, this is the place. If you are looking for a bite to eat or a cocktail while waiting for someone at the airport, or after picking up your guest, these are a few excellent destinations. They have been personally reviewed by San Diego’s Dean of Restaurant Reviewers. This ensures that you will share in the same great service and experience. The Fish Market Restaurant is less than 5 minutes from the airport. It’s at 750 N. Harbor Dr. on the Embarcadero (619-232-3474) also features the Top of the Market Restaurant (619-234-4867) upstairs, for fine dining and a fabulous bay view. These restaurants with their classy nautical decor definitely are some of the finest seafood restaurants on the West Coast. You’ll be impressed with their 100-plus seafood menu, oyster bar, sushi bar, cocktail bar and retail fish market. Island Prime (3) is only a minute and a half from the airport. It’s located at 880 Harbor Island Dr (619-298-6802) is actually two restaurants under one roof, the first is Island Prime serving steak and seafood, and the other is C Level Lounge featuring California cuisine. For spectacular bay and downtown San Diego skyline views, ask for tables 21 or 26. Chef Deborah Scott’s Island Prime features metro steaks and seafood in a romantic setting. Tom Ham’s Lighthouse (1) is only a minute and a half from the airport. It’s at 2150 Harbor Island Dr. (619-291-9110) was Winner of the 2006, 2007 and 2008 San Diego Restaurant Association’s Gold Medallion Award for “Best Sunday Brunch Restaurant.” Since 1971 Tom Ham’s has been one of San Diego’s best known landmark restaurants. It’s beautifully located on the western tip of Harbor Island on San Diego Bay, where it enjoys a fantastic view of the downtown skyline and the Coronado bridge. The restaurant boasts a Coast Guard-approved beacon, which is Beacon 9 on the nautical map.